In a prelude to Louis Farrakhan's anti-Semitic keynote address at the United Center in Chicago on February 26, the Nation of Islam held a plenary session titled “Business is Warfare: The Secret Relationship Between Blacks and Jews” as part of its Saviours' Day weekend. 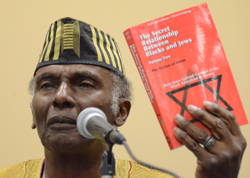 During the February 24 session, named after a set of NOI books alleging that Jewish exploitation of Blacks during the slave trade has caused deep and prolonged repercussions for African-Americans, several speakers promoted anti-Semitic conspiracy theories in line with Farrakhan’s record. Over the past three years, the Nation of Islam (NOI) has engaged in a wide-ranging campaign to demonize Jews. Not only have the speeches delivered by Louis Farrakhan been among the most hateful of his 30-year career as head of the NOI, but the organization's media arm has also reinforced these messages through a range of propaganda.